If you spend a bit of time reading about the history of Tuscany (or of anywhere in northern Italy) during the Italian Dark Age, you will soon encounter the Lombards or Longobards (sometimes written Langobards) and Longobardi in Italian. These were a Germanic tribe who established a kingdom in Italy that lasted from 568 to 774. Their castles dot Tuscany and their names are still preserved in the appellations of towns like Radicondoli and, of course, in the name of the region of Lombardy. 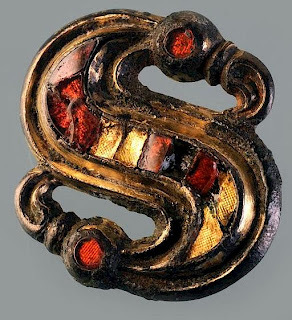 The Lombards were like the Normans, a small tribe that originated somewhere in the far north of Europe and which seem never to have stayed in one place for more than a generation. Instead, they migrated and conquered, adopting the language of their subjects and leaving their architectural legacy as far south as Sicily. The Lombard Kingdom of Italy wrested northern Italy from the Byzantines and was in turn conquered by Charlemagne and integrated into his Empire. However, Lombard nobles continued to rule parts of the Italian peninsula until well into the 11 C. It seems appropriate that the last of the Italian Lombards were conquered by the Normans and incorporated into their County of Sicily. 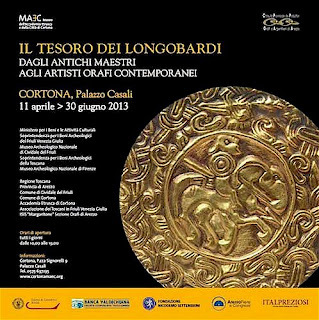 An excellent exhibition on the art of the Longobards, under the title “Il Tesoro dei Longobardi”, will be on display in Cortona at the Palazzo Casali (MAEC - Museo dell'Accademia Etrusca) from 12 April until 30 June 2013. This is the second exhibition devoted to ancient gold work in Italy, the 2007 exhibition having been devoted to the Etruscans. 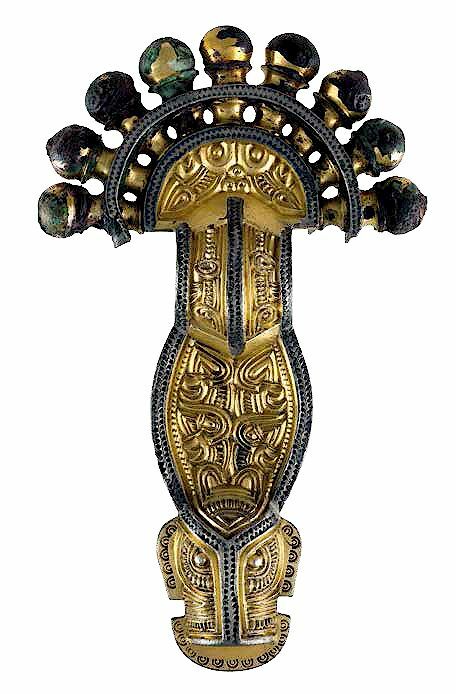 This show brings together Lombard decorative gold work from a number of Italian museums and presents it both to throw light on the artistic culture of the Italian Dark Age and also in relation to contemporary jewellery that has been inspired by Lombard work. The first part of the exhibition is an introduction to the history and customs of the Lombards in Italy based heavily on the amazing finds from two recent tomb excavations at the "Necropoli della Ferrovia" near Cividale in Friuli plus finds in the area of Cortona. The second part presents different objects from the 19 C excavations of the necropolis of Cividale del Friuli, including coins, clasps, broaches, belt buckles and pendants, as well as a copy of the famous golden disc ornament decorated with the image of a knight, together a series of objects from the coin cabinet of the National Archaeological Museum in Florence. The third part of the exhibition includes about 30 pieces of fine craftsmanship, inspired by the world of the Lombards, created by master goldsmiths from Arezzo. Highly recommended to anyone interested in a fascinating period of history and/or gold workmanship and the decorative arts. More about the Etruscan Museum of Cortona. 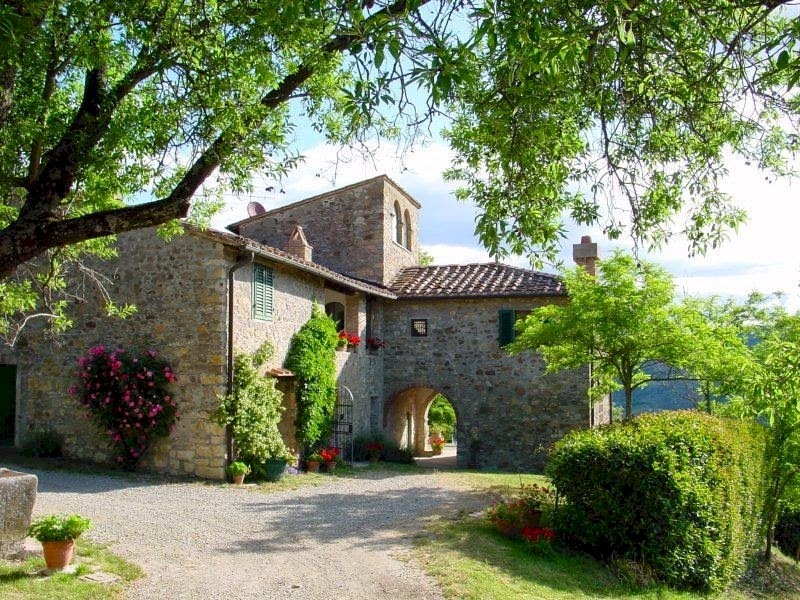 My recommended places to stay in Tuscany.